The That’s a Wrap: Best and Worst Packaging of 2018 results are in! The results are in and we have discovered a interesting connection between the top Best and Worst voted packaging. But if your not paying attention in the supermarket aisle, then you may not notice the big packaging difference hidden under the cap until it’s too late! 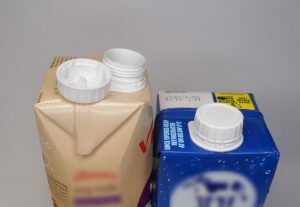 2 – Milk packaging – from half-moon inductions seals found under caps through to milk cartons. But your top pick for the worst category was plastic ring-pull tabs, found under caps of products like vegetable oil and soy sauce, as well as long life (aseptic) milk and soymilk packaging. For the Best category we also received a number of product nominations for long life and soy milk products from two different companies, Vitasoy and Devondale. We went and bought samples of the aseptic packaging for testing and found that they had the same special cap! 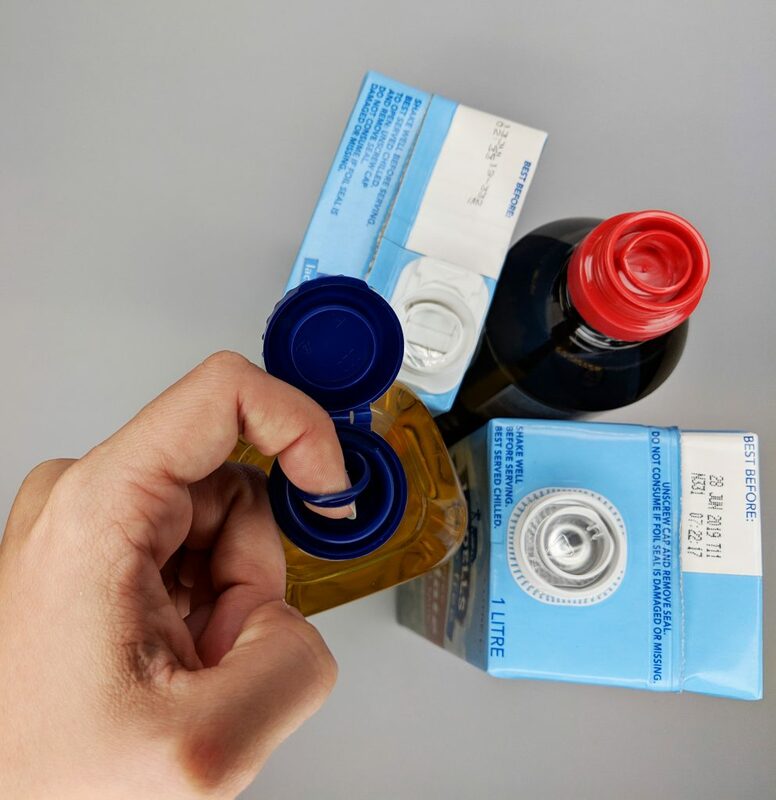 The turn-and-pour cap for aseptic packaging removes the additional ring-pull tab stage and instead breaks the seal as you turn the cap to remove it. As it’s found on some of the same products as our worst packaging category, we would encourage you to look closely next time you buy a product in aseptic packaging as your votes show there is a big difference when you get the product home and remove the cap. The top consumer choice for the Best Packaging of 2018 was a turn-and-pour cap on aseptic packaging, for products like long life milk. If you’re loyal to one particular soy or long life milk product that doesn’t have a cap you can use, we would encourage you to contact the manufacture and let them know that they should provide a more accessible cap. Alternatively, you can make a complaint on Arthritis Australia’s online packaging feedback form and we will try to contact the company on your behalf. For those interested in our 2018 nomination and voting rules that we use to tally the results, please see below. The annual social media campaign (#bestandworstwrap) is designed to highlight types of packaging consumers have struggled with or found easy-to-open in the past 12 months. Your insights will assist our Accessible Design Division in identifying if particular packaging is becoming easier or harder-to-open over time. Your responses will also be used to educate the packaging industry about your experiences with packaging and hopefully reduce incidences of wrap-rage in the future. You can describe a general packaging format like glass jars with metal lids e.g. jam jar, or opening features like an induction seal commonly found on tomato sauce bottles. ORYou can go into more detail by naming a specific product. We will then tally the results, and announce the best and worst performers on Facebook in January 2019. What does the ‘worst packaging’ mean? caused a brief moment of hesitation, anxiety or fear about opening it due to previous negative experiences. What does the ‘best packaging’ mean? Nominations that seem to be not genuine e.g. sarcastic responses or if nominations appear to be made by employees of particular manufacturers or brand owners if its believe they are trying to influence the result. You shouldn’t have to struggle with any packaging, but until that happens we want to know what packaging consistently makes your life easier. We may also buy samples of nominations to confirm that they are in fact reasonably accessible. You can make nominations through our online form, as well as our social media platforms like Facebook and Instagram, as long as we are tagged in it and can see the response. If you prefer, you can call or write to us. Your experiences are what counts! Each Facebook ‘like’ or ‘comment’ agreeing with a nomination will be accepted as a vote towards that nomination. When nominations are made as descriptions rather then specific product names, we will group the nominations and votes as best as possible when tallying the final results. A total of four votes would be tallied for Product X. If you specifically name a product and brand/manufacturer in the campaign we will try our best to contact them to let them know a nomination was made regarding their product. If you provide more details through our online form and provide an email address, we can follow up with any additional details needed to make a complaint. We will also ask your permission to share your contact details with the manufacturer so they can contact you directly about your experience. The more they know about the issues the more likely they are to make changes. Nominations will be open for all of December 2018 and the top responses will be announced on social media in late January. This is a survey about Australian packaging, so please only participate if you have been opening packaging bought in Australia. If you’re in New Zealand, let us know and we can pass your responses onto our New Zealand counterparts, who are also trying to improve packaging for consumers. Find out about what accessible design is and about the Accessible Design Division.